Heliotropis began as a conversation with Beth Deutch and Larry Rubin in Rumson, NJ. Beth and Larry have been close friends of mine and patrons of my work since they purchased a kinetic sculpture from me in 2003. At some point in 2009, Beth asked me if I would be interested in proposing a kinetic sculpture for the garden, which is no simple backyard garden but a beautifully designed and flowing mix of perennial flowers of all colors as well as evergreen trees, wisteria, and native grasses. Heliotropis was designed to be a centerpiece in this garden and was my solution to a challenge that I am often engaged with in my work, that of balancing aesthetic beauty and purely experiential interest with strong conceptual content and broader contextual meaning. 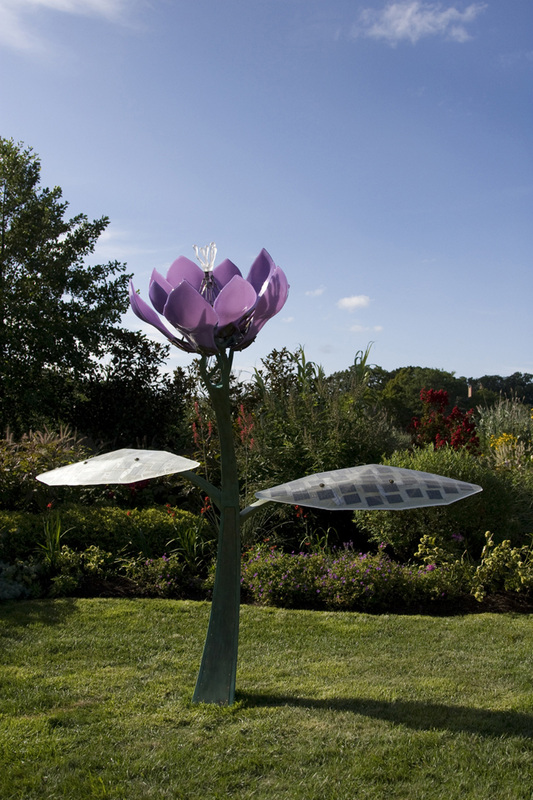 Heliotropis is a solar powered robotic sculpture in the form of a 3m tall flower made of bronze and glass. The flower opens and closes at dawn and dusk each day and the degree to which it opens is determined by temperature. The flower opens wider each day until the middle of summer and stays in a dormant, closed phase during winter while the temperature is below freezing. 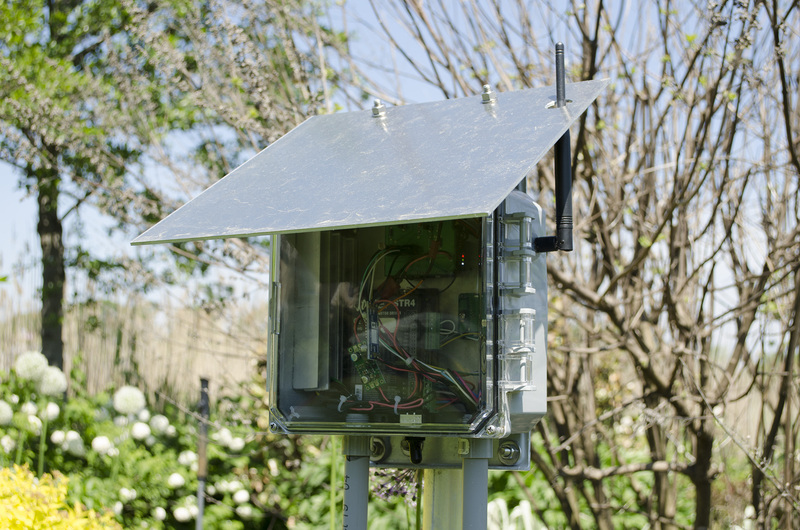 A motion sensor provides a gentle waving up and down of the flower when a viewer approaches. 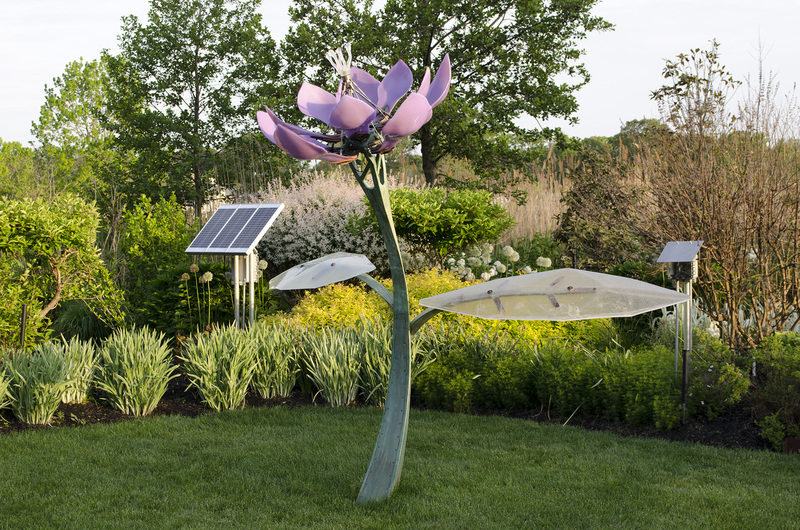 There were many things that I was exploring in this sculpture, but two of the most important points were to explore solar power as a way of providing an on-site independent power source as well as the design aspect of incorporating solar power into a sculpture in an organic and not square form. In addition, the idea of making a sculpture that actively responds to changes in the environment by changing its physical form is fascinating to me. The story about Heliotropis is one of an ongoing progression of design in response to the challenges of nature. The local climate in Rumson, NJ is one of the worst I’ve ever experienced in regards to anything man-made that exists outdoors. This is mainly due to the fact that the ocean is right there, one half-mile away. Moist salt air permeates everything and any exposed electrical contacts corrode fast. Even sealed components don’t last as long as you would think because somehow salt air and moisture get through everything. The other challenge of this site is the extreme winters, which have seen high snow accumulation at times and ice storms at others. Furthermore, climate change has directly impacted the sculpture with record storm surge flooding in 2011 from Hurricane Irene, and even worse in 2012 with Hurricane Sandy. 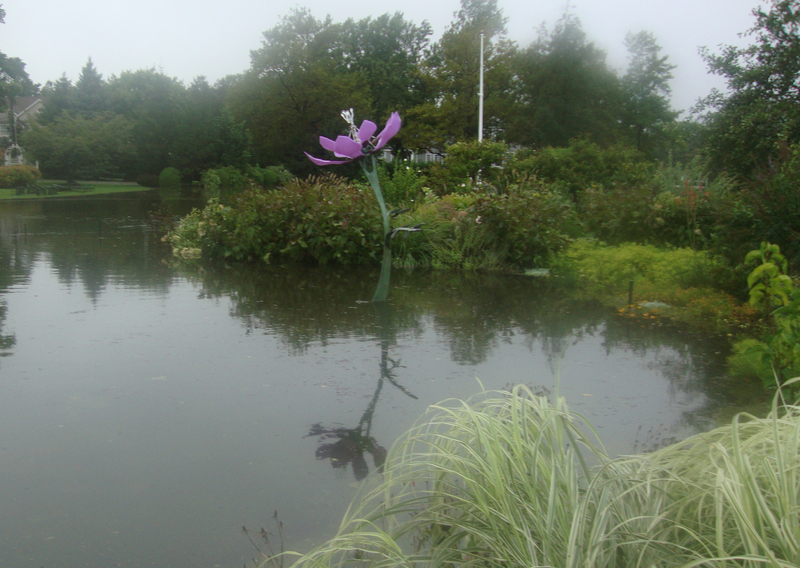 The water level during Sandy was about four feet above ground level at the sculpture and ruined the solar cells in the leaves since they were submerged. 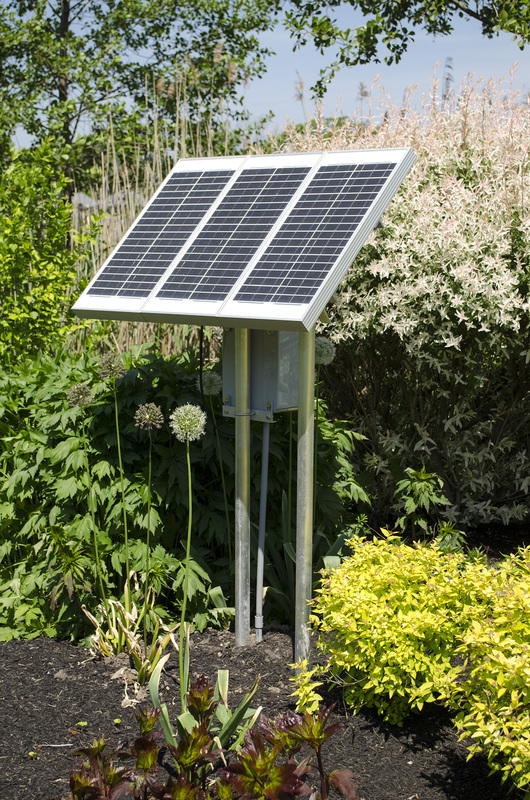 I returned earlier this summer to install new solar panels as well as a re-designed electrical system and enclosure. Both components had to be removed from the sculpture itself and placed in separate locations. The microcontroller platform was upgraded to an Arduino Yun and the sculpture now has Wi-Fi connection and a Twitter feed at HeliotropisNJ. This feed is mostly for myself at this point and tells me what the sensor readings and position are, but it will evolve to be more user friendly in the future so that anyone can see what the sculpture is doing and what the conditions are on site. In the end, Heliotropis has been a huge challenge but one that I’ve enjoyed and one that has lead to many conversations that continue to this day. For me, this project has driven my exploration of solar art and design and because of this I’ve learned a wealth of knowledge about different photovoltaic materials and technologies and especially which ones are suitable for a design like this. Heliotropis has a sister sculpture now in Coralville, Iowa called After Trillium, and I’m currently working on a new piece called Moonflower. I hope that this work inspires people to think about solar power in new and exciting ways while also pushing the boundaries of public art and outdoor sculpture as well as the role of art in the contemporary world. Solar Pavements: For real or just science fiction?